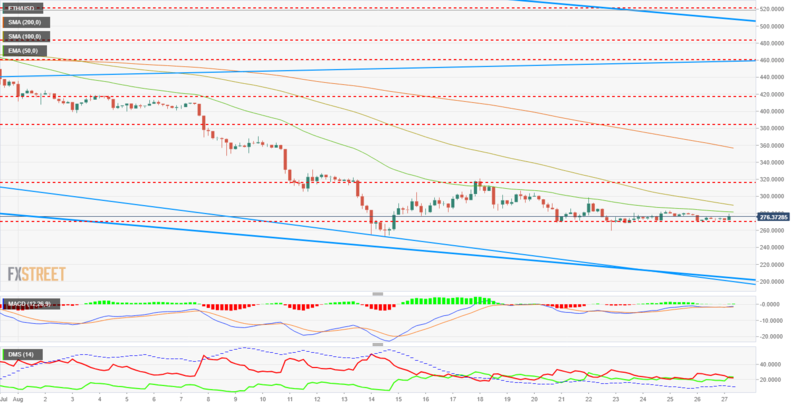 BTC/USD continues in lateral range, with the difficult challenge of breaching $6,950. ETH/USD moves upwards, looking for safety at the $330 price level. XRP/USD benefits from the focus on Altcoins, safety price level above $0.368. The Crypto board, especially in the Altcoin segment, is rising sharply during the European session. It is typical, in a market so young, that the Altcoins take a leading role as soon as the Crypto ecosystem enters an upward trend. The particular upside challenges of each Cryptocurrency to reach significant levels will require a buying force that has not appeared yet. With each passing day, long-term moving averages are dropping and getting dangerously close to price/stage zones that can make a bullish end of the year very difficult for the crypto market. For now, technical indicators continue to support a bullish scenario for the medium term, but the wait should not be long. There are a few very important weeks ahead for the Crypto sector, with a possible review by the SEC of its decision to deny Bitcoin ETFs launching permits, and they may come at the most necessary time. For the entire Crypto board, this is the fact at the ground base. BTC/USD is currently trading just under $6,700. Above this price level, Bitcoin has a combination of 4 obstacles that should be complex to overcome. First, at the $6,750 price level, a price congestion resistance that has the added difficulty of being just below the trend line from the June lows. This means that any attack on this resistance should also be able to overcome the trend line and regain the upside of it. If not, statistics tell us that the attempt will fail. If BTC/USD can overcome this trend line, it will immediately encounter another price congestion resistance at the $6,850 level. 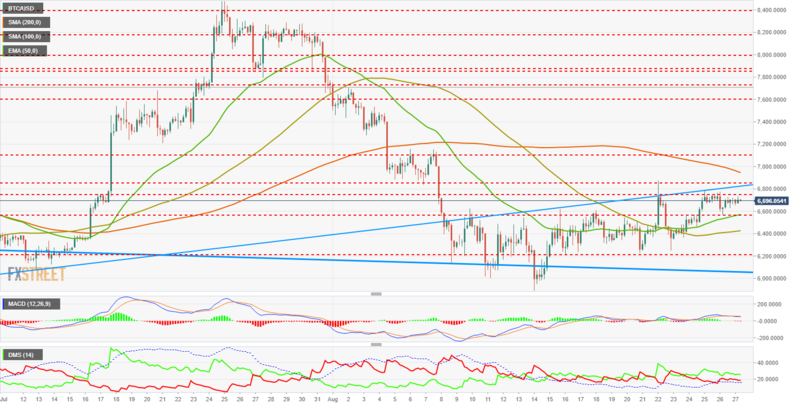 If the accumulation of barriers were not complex enough, the 4H SMA200 continues its decline and is currently placed at the $6,950 price level. BTC/USD will need a lot of money to carry out this task. Below the current price level, nothing to highlight until down to the $6,200 price level. If Bitcoin lost this support level, the base of the bearish channel coming from February highs would give a second chance to save the situation. Losing this support would also leave the June lows as the last reference barrier before moving to a bearish scenario with targets around 30% below. The MACD at 240-Min moves above the 0 line of the indicator. It does this by forming a lateral structure with a chance of moving to a downward lateral position in the next few sessions. The DMI at 240-Min continues to show an advantage for buyers while sellers continue to decrease their trend strength. The ADX continues to gain strength but has not yet surpassed level 20, which considers the price trend to be valid. ETH/USD is compressed between a support for price congestion at the $270 level and the exponential average of 50 periods at the $280 price level. These are the current reference levels for the Ethereum. Above the current price, exponential average apart, next hurdle in the $290 price level, where the SMA100 now passes. Above the $330 price level, ETH/USD would go into short-term bullish mode, but still with a long way to go, up to the $460 price level, to project this bullish force in the medium term. Below the current price, the target stands at a staggering $200 mark, where the state of the nerves of all those with an interest in the ETH/USD would receive a critical test. The MACD in 240-Min shows a profile mirroring the Bitcoin situation. Indicator below the 0 line but with a lateral structure that is insinuated instead, towards a situation of rising laterality. The DMI at 240-Min shows a tie between buyers and sellers, with statistical advantage for buyers to come from below in the cut. The ADX gives no sign of life and continues to decline, underscoring the lack of price movement since mid-August. XRP/USD at 240-Min shows a structure similar to that of Ethereum. Laterality as long as the price does not fall outside the range between the price level of $0.37 above and $0.31 below. XRP/USD is currently trading at a price level of $0.328, being the only one of the three in the TOP3 to move above the EMA50 and SMA100. This particularity must be taken into account very carefully. Above the current price, the first price congestion resistance at the price level of $0.345. If it manages to overcome this obstacle, XRP/USD will encounter another price congestion resistance at the level of $0.368, where the SMA200 is now also running. From this last price level, XRP/USD would enter bullish mode in the short term, not being able to consider its upward movement in the medium term until it does not breach the price level of $0.450. 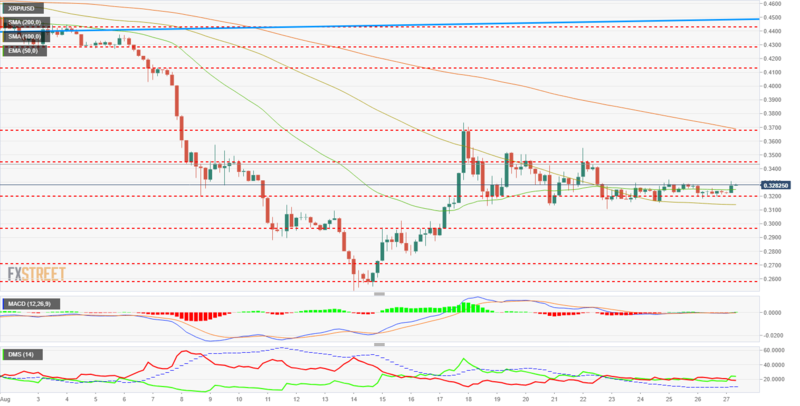 Below the current price, XRP/USD would find support in the EMA50 first and the SMA100 later. These are two very reliable supports. Below these moving averages, support for price congestion at the $0.30 level. If you lose this level, you lose 10% of the target price to the next media due to price congestion at the $0.27 price level. A loss of this support level would leave the price level of $0.26 as the last reference point before a sharp price drop with unpredictable consequences. The MACD at 240-Min is supported on the 0 line and slightly cut upwards. It reflects the price situation above two important moving averages. Bullish potential. The DMI at 240-Min shows increasing buyers, who have taken control while sending sellers below level 20 of the indicator, who have lost their trend strength. The ADX is at very low levels, indicating an absolute absence of tendency but increasing in the last few hours.